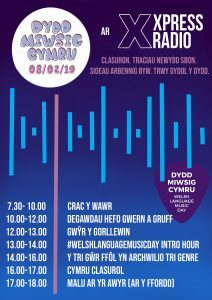 On 9/2/19 for the third year in a row, Xpress Radio celebrated Welsh Language Music Day, a day known in Welsh as Dydd Miwsig Cymru. The day celebrates all forms of Welsh Language music, truly challenging the presumption that Welsh music is merely one genre. 2017’s inaugural Welsh Language Music Day was celebrated by Xpress with a two-hour special by current exec Aled Huw Russell and Harri Hughes whilst 2018 saw Xpress’ celebration increase to six hours of shows. 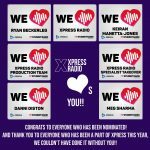 With events dotted around Cardiff and the rest of Wales to celebrate the occasion, Xpress once again spoiled listeners with a day jam-packed with shows, interviews and non-stop music. The day was organised by Welsh Language Coordinator Aled Huw Russell and Welsh Language Production Coordinator Rob Jones, who curated two playlists. Playlist A featured the biggest Welsh language classics from the likes of Geraint Jarman and Diffiniad as well as the newest indie pop bangers from bands such as Gwilym and Hyll. Playlist B featured a more eclectic mix of alternative Welsh artists, such as Jylopis, Llwybr Llaethog and Gorky’s Zygotic Mynci. As for shows, there was an Xpress record 10 and a half hours of Welsh language shows on the day for 2019’s celebration. Crac y Wawr kicked the day off with a breakfast show in their usual bubbly style, who were then followed by Gwern and Gruff, who led listeners on a journey of Welsh music through the decades. Gwŷr y Gorllewin played an hour of politically charged songs and the Welsh Language Music Day Intro Hour was presented by execs Rob Jones and Aled Huw Russell. It was a crash course for those, Welsh speaking or not, who may not have been previously exposed to Welsh language music. Y Tri Gŵr Ffôl then returned to explore a genre each, with Ifan playing ska/dub/reggae, Rob playing electronic and Aled playing rap. Daniel O’Callaghan and Rhodri Davies made their Xpress Radio débuts with Cymru Clasurol, playing an hour of classic tunes. Gwern and Deio wrapped up a hectic day with Malu Ar yr Awyr (Ar y Ffordd), where they went for a road trip around Wales, sampling the best artists from every corner of Wales.